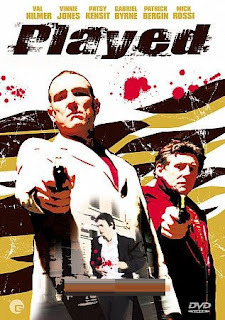 Played was a decent crime thriller despite its budget shortcomings. Ray (Rossi) is a small-time thief who is framed for a crime he didn't commit. When he gets out of jail, he falls back into the same life. The budget for this movie was $338,000, so I understand why it was shot on video instead of film. I was worried about that because the usual Lionsgate (shot on video) output is usually terrible ("Green River Killer", "Heebie Jeebies"). It actually looks good in most scenes. Mick Rossi does a fine job as Ray. But the big name stars are only in this for maybe five minutes each. Kilmer does his usual professional work. His dialogue was improvised and it shows. ("You're not gonna Taco, Ray.") Jones plays a good bad guy. Byrne appears stiff and looks like he wants to be anywhere else. I also noticed that almost all the actors are on the phone. It's pretty cheap just to shoot actors talking on a phone. Overall, Played was a satisfactory crime flick, that's a good second or third choice at the video store.